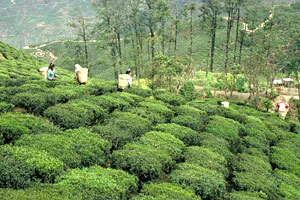 India Tours, Sikkim-Darjeeling tours, Sikkim-Darjeeling travel, Sikkim Darjaleeing Trekking. Sikkim lies nestled - and almost hidden - between Nepal, Bhutan, Tibet and Darjeeling in the Eastern Himalayas. 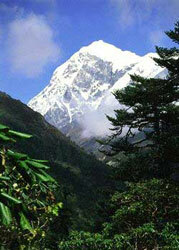 This small but beautiful land is dominated by Mount Kanchenjunga, the third highest mountain in the world. Religion forms an integral part of the daily lives of the Sikkimese, and Kanchenjunga is revered as their protective deity. With 200 Buddhist monasteries dotted across the tiny land, the influence of Buddhism is everywhere. Even in the remotest hamlet, the fluttering of prayer flags are a constant reminder of the teachings of Lord Buddha. Until 1975, Sikkim was an independent kingdom ruled by Chogyals (kings). The history of Sikkim's Chogyals dates back to the sixteenth century, when the first Chogyal was consecrated by three holy men at Yoksom, in West Sikkim. In 1975, following a popular movement to abolish the monarchy, Sikkim became the 22nd state of the Indian Union. Long a restricted area, Sikkim now welcomes a few visitors from around the world to share its rich heritage and natural bounty. Blessed with a cool and bracing climate, and a panoramic view of the Himalayas, the world renowned hill resort of Darjeeling is a welcome respite during the hot summer months. Situated at 2134m above sea level, Darjeeling was acquired by the British from the Raja of Sikkim as a gift around a hundred and fifty years ago, and developed it as a rest and recreational center for their troops. Today the town retains many of the legacies of the British Government. Darjeeling's population of about 100,000 is made up of people of many races and religions. Gorkhas, Bhutias, Lepchas, Sherpas. Yolmos and migrants from the plains have all made Darjeeling their home, and everyone lives in perfect harmony; at the shrine at Observatory Hill, you'll find Hindus and Buddhists offering prayers alongside each other. The official language is Gorkhali (Nepali), but Hindi and Bengali are also spoken, and almost everyone understands and speaks a bit of English.